Did you know that you can modify the layout of the Invoice Payment Requests that you review and approve? Concur allows for the Invoice Images that were uploaded to the Payment Request to appear automatically in the Payment Request view without having to be opened. To update your settings, open an invoice image in an Invoice Payment Request and click on the Pin icon in the top right corner. After doing this the Invoice Image will appear in the same view as the Invoice header and line item details. If you do not like the updated consolidated view, you can revert to the previous settings by clicking the Unpin icon in the top right corner of the image. We notified you last month that Concur has announced that they will be releasing a few user experience improvements coming soon to Concur Invoice. This update will take effect this month on April 13th. 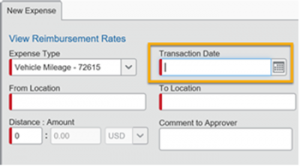 The primary impact to UA will be a change in terminology replacing the current “Payment Request” with “Invoice.” As a result, a Concur Invoice Payment Request will now simply be a Concur Invoice. The update will also enhance the current “Manage Requests” tab of the Invoice Module with a new “My Invoices” page. Remember that Spring Break is upon us! We all get very busy in the days before the break. Avoid the rush in Accounts Payable by submitting your Expense Reports and Invoice Payment Requests as soon as possible. Additionally, ensure you have marked any items ordered and received via the Purchase Order process as received in BuyBama. We would like to process all of your payments for you prior to the upcoming break. Concur has recently announced that they will be releasing a few user experience improvements coming soon to Concur Invoice. The primary impact to UA will be a change in terminology replacing the current “Payment Request” with “Invoice.” As a result, a Concur Invoice Payment Request will now simply be a Concur Invoice. The update will also enhance the current “Manage Requests” tab of the Invoice Module with a new “My Invoices” page. Concur has announced that the changes will take effect for all users on April 13, 2019. Look for more information regarding this user experience update in the April 2019 newsletter. As you begin planning for newly hired employees, please remember that UA adopted a moving allowance policy in 2018 as a result of the Tax Cuts and Jobs Act that went into effect January 1, 2018. The Act eliminated the exclusion/deduction for qualified moving expenses, and as a result, UA no longer pays moving companies directly or provides reimbursements to individuals for moving expenses. Newly hired individuals can use our contract vendors and benefit from our negotiated rates but will pay the vendor directly. Newly hired employees can elect the timing of the moving allowance payment. For more information on moving allowances and temporary living allowances, please see Section 9.0 of the UA Spending Policy. Effective January 1, 2019, the mileage rate paid to persons traveling in privately owned vehicles on official business for the state will be 58 cents per mile (up from 54.5 cents in 2018). These mileage rates are available in Concur and on the Accounts Payable website Mileage Rates page. When entering mileage in your Concur Expense Report, please ensure that you are including the correct Transaction Date in the Mileage Form. For example, if travel occurred in 2018, please ensure you have entered the correct transaction date in 2018 in order to properly calculate the mileage. Remember that the holiday season is upon us! We all get very busy in the days before the holiday break. Avoid the rush in Accounts Payable by submitting your Expense Reports and Invoice Payment Requests as soon as possible. We would like to process all of your payments for you prior to the upcoming break. With year-end deadlines approaching, we would like to emphasize the importance of placing transactions for FY18 and FY19 on separate Concur Expense Reports as well as carefully entering the invoice date on your Concur Invoice Payment Requests as the procedures for Prepaid and Accrued Expenses have been updated for the upcoming fiscal year end. Prepaid expenses (items paid for in the current year but the goods or services will not be received until the next fiscal year): Account code 107101 Prepaid Expense will no longer be available in Concur. Be sure to use your normal expense account code in Concur for these items. Please note in Details/Comments in Concur, in your report header in Concur and/or on your backup documentation the appropriate year for expenditure (for example, FY18 or FY19). AP/P-Card Services will apply a fiscal year indicator based on this information. All transactions on the report will be classified as either FY18 or FY19, so it is very important that you not commingle FY18 and FY19 charges on one report. If this occurs, AP/P-Card Services will return the FY19 transactions to you to be included on a separate report. Financial Accounting will run reports weekly to move prepaid expenses to the prepaid account code for the current year and reverse in the new year. Accrued expenses (expenses incurred in the current year but not paid until the next fiscal year): Be sure to carefully enter the invoice date in Concur. The invoice date for payment requests should reflect when the goods were received or the services were performed. This may not coincide with the actual invoice date on the invoice. Please note in Details/Comments in Concur, in your report header in Concur and/or on your backup documentation the appropriate year for expenditure (for example, FY18 or FY19). AP/P-Card Services will apply a fiscal year indicator based on this information. Monday, September 10, 2018, DUO two-factor authentication will be added to the Concur login. DUO is designed to protect the sensitive data held within users’ Concur accounts. If you are already a DUO user, on September 10, you will simply begin to see a DUO prompt when logging into Concur. If you are not a DUO user, you will not notice any change. You will be able to login as usual. If you would like to register for DUO, please visit duo.ua.edu. Please contact the IT Service Desk at 205-348-5555 or itsd@ua.edu with any questions or concerns. The Concur Mobile app is an optional tool that allows Concur users to book travel, capture receipts, and work with expense reports and payment requests from a smartphone or mobile device. Previously, users could also use the ExpenseIt app in order to use more advanced OCR capabilities in order to upload receipts to the Concur system. The ExpenseIt functionality will be available directly in the Concur mobile application, starting on August 13, 2018. What does this mean? ExpenseIt in the Concur mobile app will turn receipts into expense line items and send them directly into Concur Expense without the requirement of an additional app. Users will need to verify that they are using the latest version of Concur mobile, at least 9.52 or above, but there will be no login change for the Concur Mobile App.